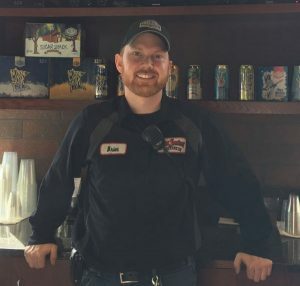 COLD SPRING, MN – Cold Spring Brewing Company (CSBC), the #1 producer of exclusive beer and craft beer brands for major retailers throughout the world, is pleased to recognize Brian Topp, Maintenance Planner for 13 years of outstanding work in maintenance at CSBC facilities. Topp began working as a Line Maintenance Technician for CSBC in 2004, after graduating from Alexandria Technical College and working for Douglas Machine in Alexandria. Topp’s background in automation in a production environment has made him a valuable addition to CSBC’s team. As Maintenance Planner, Topp wears many hats. He coordinates work for the maintenance staff, handles quotes for work and equipment and keeps CSBC running as smoothly as possible. The role of Maintenance Planner for a large-scale production facility is never dull. Between scheduled downtime for preventative maintenance and unexpected events, Topp’s team keeps busy. Quick power outages can wreak havoc on processing equipment, and with the extremely windy conditions experienced by most of Minnesota in March, it was a busy month for Topp. “My top priority is to keep our equipment running without ever having unscheduled breakdowns,” said Topp. CSBC is a state-of-the-art brewery and beverage product developer and producer that includes Third Street Brewhouse and Monarch Custom Beverages. Third Street Brewhouse’s tap house is open on Fridays from 4-8pm and Saturdays from 12-5pm.